Close to 329.1 million people are projected to buy goods and services online in India by 2020, says the US-based statistics portal, Statista. This means that about 70.7 percent of internet users in India will have purchased products online. The boom in online shopping is not limited to large metros and urban areas. Thanks to proliferation of smart-phones and high speed 4th Generation (4G) mobiles, online shopping is a trend in semi-urban and rural parts of India too. This growth in volume of online shopping has a reflection on revenue as well, Statista further adds. Retail e-commerce sales in India are forecast to grow tremendously, with projections to jump from around US$ 16 billion in 2016 to just over US$ 45 billion in 2021. According to Statista, in 2016, Amazon.in was leading amongst the top 10 online shopping sites in India with net e-commerce sales of US$ 437.7 billion. Other toppers were Flipkart and Snapdeal, which also offer cheap online shopping in India. Flexibility of payment such as Cash-On-Delivery and paying in easy installments. Reliable delivery services from online shopping sites. Returns policy, should the product they receive be defective or is irrelevant to their needs. Frequent sales and discount offers. 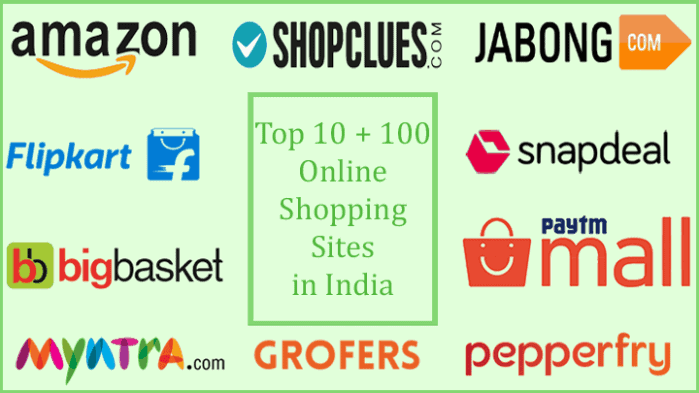 Based on customer feedback, personal experience as well as statistics from reliable sources, we list top 10 online shopping sites in India. All of these are also cheapest online shopping sites meaning, you can get stuff here much cheaper than at stores. Amazon India is the darling of all online shoppers in India. This is aptly reflected by the fact that online shoppers worldwide bought stuff worth whopping US$ 437.7 billion in calendar year 2016. Amazon India recorded sales worth Indian Rupees 322.5 billion (about US$ 49 billion) during the first quarter of financial year 2017-18. What makes Amazon India popular? Firstly, it ranks topmost as the cheapest online shopping site in India. 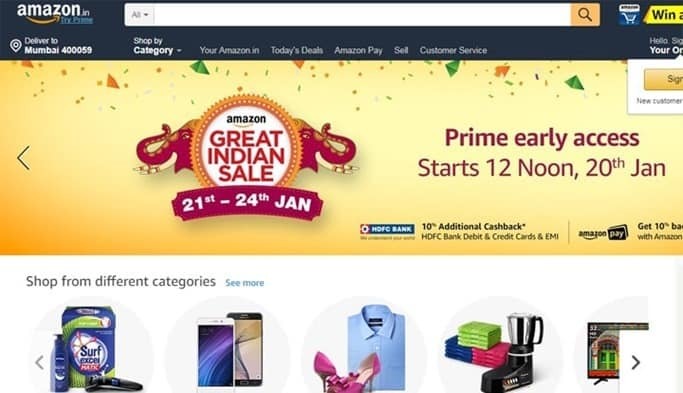 You can buy any stuff at Amazon India for rates that are at least five to 10 percent lower than other online stores in this country and as high as 85 percent on selected products. For an annual membership of Rs. 499, Amazon India offers membership to Amazon Prime. Members of Amazon Prime enjoy a host of benefits including delivery on the same day or within 24 hours in select cities, free videos and zero shipping charges on a wide array of goods. Nearly 100 million products are sold by Amazon India, including those from small retailers, Self Help Groups and charity organizations. Amazon India’s app is amongst the most popular top online shopping sites app which is extremely popular among smart-phone users. During first quarter of financial year 2017-2018, Amazon India recorded a sales growth of some 104 percent over fiscal 2016-2017. Homegrown Flipkart remains second topmost amongst the top 10 online shopping sites in India. Flipkart offers over 80 million products in nearly a hundred categories. Flipkart is renowned for being more sensitive towards the Indian market. Hence, this is amongst the top online shopping sites which outstrips its competitors during three or four day sale held at the onset of Indian festivals. Thanks to stiff competition in India’s e-retail sector, Flipkart is planning to invest more on its operations in coming years. Despite stiff competition from top foreign and Indian online shopping sites, Flipkart holds some 40 percent of India’s online shopping market. Flipkart is also one of the top cheap online shopping sites of India. During the first quarter of financial year 2017-2018, Flipkart’s sales grew by 29 percent, over fiscal 2016-2017. In just about six years, ShopClues has emerged as the third top amongst the top 10 online shopping sites in India. 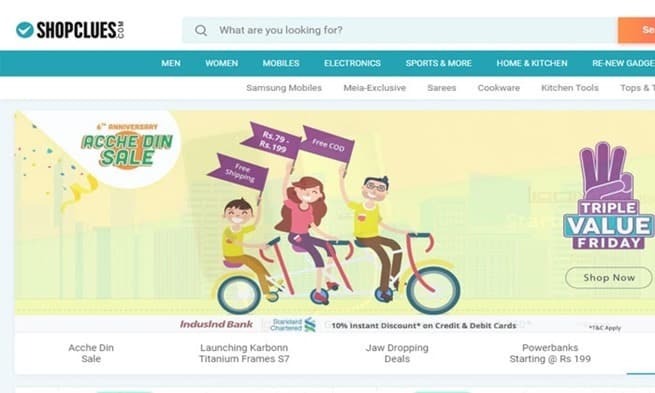 Launched in 2011, ShopClues now claims to offer some 28 million assorted products ranging from expensive electronics and niche market mobile phones to jams and breakfast cereals. During the first quarter of 2017-2018 financial year, ShopClues recorded a tremendous growth in sales volumes by 58 percent as compared with fiscal 2016-2017. ShopClues owes it success to superior quality merchandise and extremely customer friendly policies. It has some 650,000 merchants located across India. ShopClues delivers stuff to addresses located in over 32,000 Postal Index Code (PIN) locations of the country. 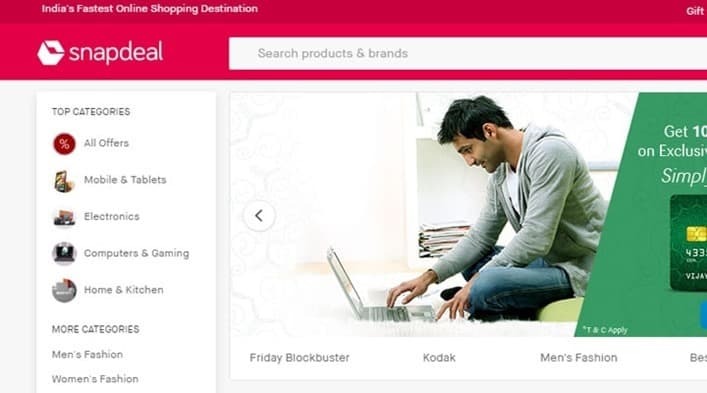 Third on our list of top 10 online shopping sites in India is Snapdeal. 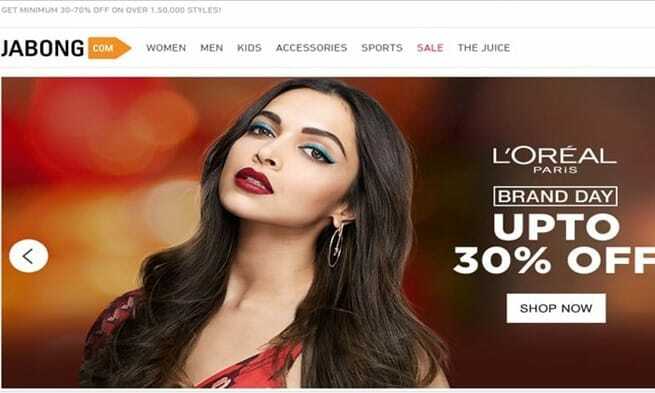 This cheap online shopping site in India offers over 35 million products from more than 800 diverse categories from over 125,000 regional, national, and international brands and retailers. With millions of users and more than 300,000 sellers, Snapdeal is the online shopping site for Internet users across the country, delivering to 6000-plus cities and towns in India,” claims Snapdeal’s website. Snapdeal has managed to retain its position as one of the leading online shopping sites of India, thanks to its fast delivery system and the ability to adapt quickly to newer challenges and market demands. We rank Paytm Mall as the fourth on the top 10 online shopping sites in India for two main reasons. Firstly, Paytm Mall offers everything you need, from groceries to high-end electronics and mobile phones. It is also one of the cheapest online shopping sites in India. Paytm Mall operates mainly through its eponymous mobile payment app. Meaning, all you can buy anything from Paytm Mall but have to pay only through Paytm mobile wallet. The two can be easily synced on your smart-phone. 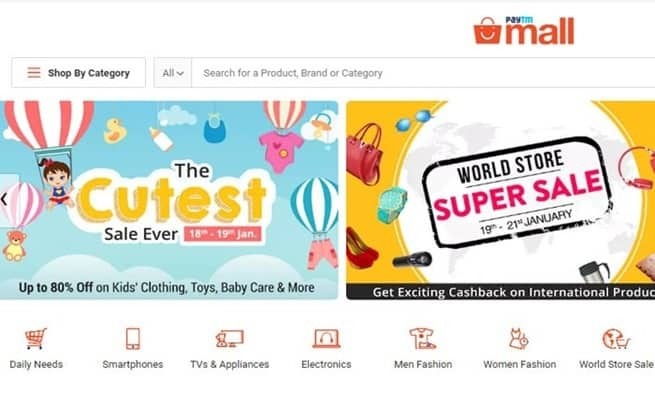 Paytm Mall emerged on list of top 10 online shopping sites in India thanks to the November 2016 demonetization of Rs.500 and Rs.1,000 notes of the Indian currency. Paytm effectively used the popularity of payment wallet to launch Paytm Mall. Since its launch nearly decade ago, Myntra has emerged as India’s favorite online shopping site for fashion conscious women and men. It is also one of the top 10 online shopping sites in India, attracting millions of buyers daily. Myntra is also a cheap online shopping site in India, if you are looking at buying high fashion ware at very affordable and reasonable rates. Myntra stocks readymade apparel from top and emerging Indian fashion brands as well as globally renowned foreign designers. Few in the online shopping industry can compete with rates Myntra offers. In addition to fashion wear for kids, teenagers and grown-ups, Myntra also offers the complete range of home décor and furnishing products for cheap. Cosmetics, fragrances and dress accessories are also sold online by Myntra. Ranking at No-6 on our list of top 10 online shopping sites of India is the homegrown Jabong. This cheap online shopping site is very popular among the younger generation because they can buy high quality fashion wear and dress accessories at very reasonable rates. Jabong offers a unique feature called ‘The Juice’ – an online guide to fashion and latest trends in India and abroad. You can buy anything from a trendy suit to humble soap at Jabong. 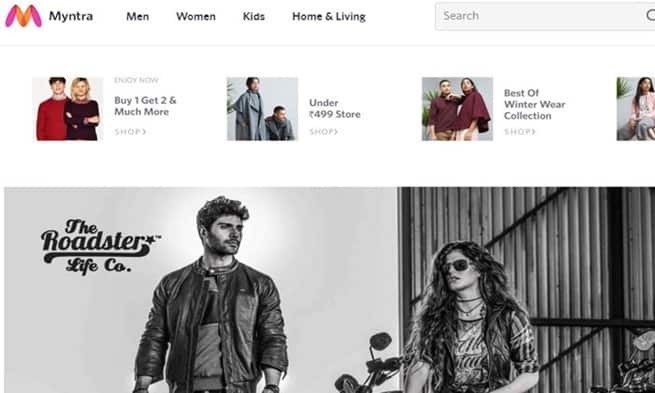 Alongside readymade fashion wear for all ages, Jabong also offers a wide selection of sports goods, accessories such as belts, wrist watches, bags and wallets, fragrances and sunglasses. 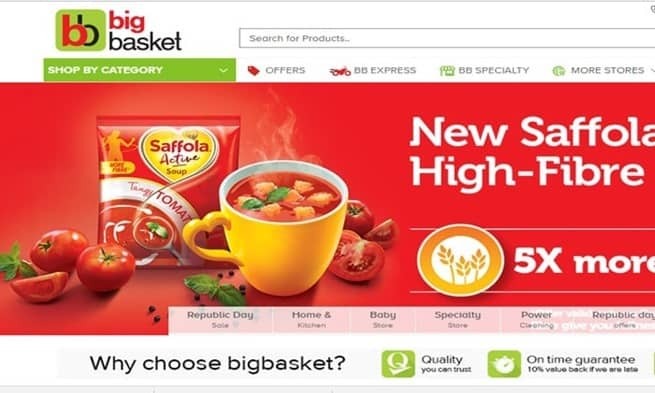 Undoubtedly, bigbasket is India’s topmost online grocery store and one of the cheapest online shopping sites. Indeed, bigbasket is counted among the pioneers of online grocery shopping in India. With over 18,000 products and over a 1000 brands in the bigbasket catalogue you will find everything you require for your home. Offerings from bigbasket includes fresh fruits and vegetables, rice and cereals, spices and seasonings, packaged products, beverages, meat, fish and poultry products, dairy items and other essentials. The success of bigbasket comes from big cities of India, where working people have little or no spare time to shop for food and non-food household essentials. Operating in nearly two dozen large cities of India, bigbasket offers a wide range of benefits such as discounts on your daily requirements such as foodstuff, body and beauty products, home and personal hygiene products. Additionally, you also get free home delivery on orders worth Rs. 1,000 and above. The best part is, you can choose the delivery time to suit your convenience. In first quarter of fiscal year 2017-2018, bigbasket was leading amongst the top 10 online shopping sites in India, having recorded whopping 206 percent growth over fiscal 2016-17. 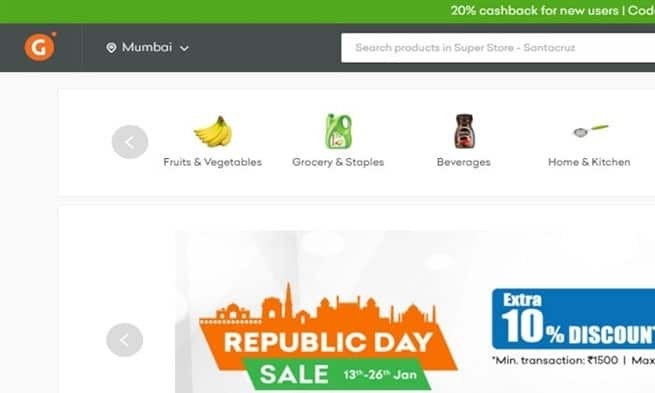 With daily discounts on a wide range of products, Grofers is credited with changing the manner in which Indians shop for groceries and other common household requirements. One of the best features you will enjoy while shopping online at Grofers is the local flavor. Meaning, Grofers either automatically detects you location or allows you to choose the city and state from which you wish to order your requirements. This way, you are assured of getting various foodstuffs and household requirements from your native state delivered to your home elsewhere in India. For this purpose, it has agreements with retailers across all major cities of India. Additionally, Grofers also offers round-the-clock delivery, allowing the timings best suited for you to receive your stuff. 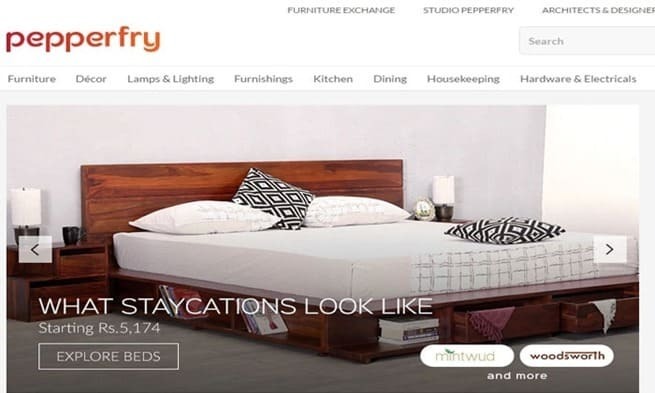 Pepperfry is India’s topmost amongst the top 10 online shopping sites that sells furniture and décor for home, office, outdoors and every other conceivable premise. Normally, anyone would balk at the idea of buying furniture and décor items online, since you would usually want to see the product first. However, Pepperfry has changed this old concept. When you search for any item, this top shopping website in India will display the choices available. However, you will also get useful tips and guidelines about how to select furniture or décor and other stuff best suited to your needs. For example, if you are buying a bed cover, the website will brief you about the uses of various types of patterns, to help you choose the best option. You can also buy gardening equipment, toilet fittings, lamp shades and chandeliers, exclusive curtains and other excellent stuff that adds life to your home, office and outdoors at Pepperfry. Shopping online can prove pretty confusing. This is due to the vast array of products available, special offers, discounts, delivery periods, flexibility of payment and other factors. Hence, we provide a list of top 100 online shopping sites in India. You may find that some online stores in India do not deliver to your location. This is mostly with online grocery stores which operate in major cities only. However, most of the other stuff can be readily bought even if you stay in rural areas. Online shopping is also a great way to save money. We hope the above listing will serve as a one-stop guide for the top online shopping sites in India. Before you rush to buy any product, it Is best to visit some of the top 10 online shopping sites in India and see what they have on offer. Also look for: · Flexible payments policy. · Returns policy. · Hidden charges. · Delivery speed and charges. · Warranty/ Guarantee from manufacturers. You can also compare prices between two cheap online shopping sites in India and decide where to buy. With new entrants coming into India’s online shopping business every year, the competition is bound to get stiffer. As consumers, this translates for you as wider selection at low prices. India is one of the fastest-growing e-commerce markets worldwide, with millions of new Internet users taking advantage of cheap mobile connections to find the cheapest online shopping sites. According to recent market research, mobile phone Internet user penetration in India is projected to reach 37.36 percent of the population in 2021, representing a huge potential in terms of digital and mobile buyer audience. Total internet audiences in India are estimated to surpass 635 million online users in 2021. BaloTrade.com is the cheapest best online marketplace to sell and buy any products, BaloTrade is a free marketplace for suppliers from any countries to sell you can start using BaloTrade.com right now just sign up balotrade.com/SignUp. Amazon and Flipkart are two giant eCommerce companies in India. Both offer easy returns, replacements, cash on delivery, and EMI options which are very much essential in India where first time buyers prefer these options. However, other eCommerce companies are also emerging by offering the same options to their customer. One should seek above mentioned options while shopping from any site for a seamless shopping experience. Such huge list on Online Shopping website. Really usefull in todays day to day life. I would love to share one more name in this Jealousme. This website is new yet trust worth and good for online shopping. I can’t thank you enough for such an amazingly insightful article. Starting an commerce fashion brand can be a daunting endeavor, but this lays out all the fundamental guides in such an easily digestible manner. I’m grateful for the information.